I took this shot while walking down my in-laws front walk in the middle of the night, in the middle of the country. No tripod, no **flash**, or anything. I just pulled the camera out of my pocket and shot. Unbelievable. It was a real setback when I lost my second-generation digital elph a while ago. I try to always carry a camera with me and it was so easy to just slip it into my pocket. Replacing it was a big priority but I wanted to be smart about it. My friend Briscoe recommended that I try the Canon S90, a performance-oriented successor to the elph. The reviews looked good so I picked one up. Everything I read turned out to be true but I still cannot believe how well it performs in low-light conditions. It almost never needs a flash (good-bye red-eye!) and allows interior shots with ambient light, which look much more true. Of course, the variety of types of light in indoor settings creates some white-balance issues, but it's a nice problem to have. Some would call that freedom. The camera truly astonishes in ultra-low light, thanks to an available 3200 ISO and some very smart noise reduction protocols. 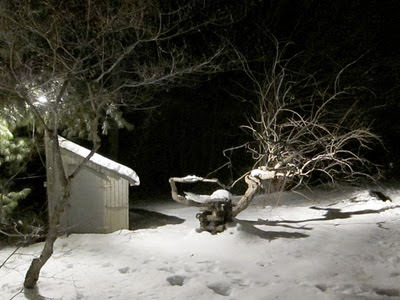 I have always loved nocturnal photography, which can be very challenging. With the S90, it's much easier and that will open new possibilities. I also love the manual focus option (which I've never seen in a point-and-shoot), the flexible controls, and the wealth of settings and filters. On the whole I love it and it has already produced some amazing images, and it's always thereL right in my pocket. Front portico of my high school, Montgomery Blair--an amazing place I stumbled into and marched out of with a high chin and mortarboard. Image pilfered without apology from a nice article in Open Salon. When Jen Dalton asked me if I would like to take part in her table discussion “Art World as High School” (March 17) I had misgivings. I felt the description painted high school—and the art world—as a closed environment ruled by cliques, where acceptance and status are all-important and all-consuming. Not only is this analogy incorrect—the world of art is infinite, as big as the collective imaginations of the millions who make and love art—but that line of thinking is unhelpful in the extreme. It seemed the opposite of helpful, actually. As one who spends his days on the front lines of the art market, I constantly hear the voices of the excluded sighing predictable fallacies like “If I were an art collector…” “If I had money…” “If I had taste…” as justifications why they could not step deeper into the universe that art has to offer. The absolute last thing I want to encourage is the idea of art as province of some elite cadre of insiders. That benefits only small-minded people jealously guarding an inflated market, while stifling innovation and depriving the larger world of art’s innumerable benefits. I don't think it's true but the perception is out there and it's devastating and part of me felt that to even debate the topic lends it credence. Thoughts evolve and the only way to purge a demon is to flush it out into the open, so I decided to join the discussion: is the art world (if we can agree what that is) like high school? If so, is that a good or bad thing? Let’s start with the profile of an Artworldling; how would they fit into the imagined cafeteria-table system? In my experience, the art world is full of former outcasts—people who were probably not sitting at the “cool” table in high school. They would be pretty nerdy, or natty, sitting with the “creative types.” If that group has morphed into a bunch of exclusionary snobs, it would be pretty depressing. Perhaps it is inevitable but those who have suffered should not make others to suffer at the first opportunity, especially when there’s not even a pretense of redistributive justice. I, for one, will not tolerate that on a personal level. Life is too short. There is also the idea that those who peaked in high school have probably declined since then—the 20-year reunion phenomenon where the former cheerleaders are fat and the football players are plumbers, and the geek has a great life. While not a universal phenomenon, it does ring true to me. So if the art world is indeed full of closed doors, and the logic holds up, then it’s actually better to be excluded from the clique-du-jour. Those obsessed with status today will be pathetic tomorrow. Maybe Art World High School is not so bad after all! There is second way to approach the discussion. Instead of viewing high school from a hypothetical anthropological perspective, what if we look at it in terms of personal development? Then the analogy gets really interesting. The high school years are a time, terrifying for many, when one begins to make consequential decisions about how to live. What we do not realize at the time, however, is that what we do matters much less than how we do it. Fashion and cool mannerisms are important not because they indicate some Darwinian capacity to keep up with the pack, but because of what it says about our relationship to our fellow humans. Will you follow or will you lead? Indeed, a terrifying choice and few choose the latter. For me—and I can only speak of my own experience here—high school was a triumphant time, not because I was the most popular kid, but because I came to understand over the course of those four years that I didn’t have to play that game—couldn’t and mustn’t because it wasn’t my path. There are infinitely many ways to live and each person needs to do what works for them. Ultimately, that realization brought a measure of popularity by the end of high school and I’m well situated now with an interesting life, beautiful wife, and the same body I had back then. That’s what art is for: it’s all about trying to make sense of a mysterious life and putting things together in new ways that somehow just work. So, from the standpoint of personal development, the life of this Artworldling is exactly like high school, and I love that. Labels: Art Scene, Personal renewal, ThinkTank, Why Art? The New York Times description of this weekend's blizzard noted its sharply-defined shoulders. Last entry led with the sundog that announced the storm's coming. Today we see its tail as it roars away to the northeast, leaving Charlottesville cloaked in a thick white blanket. It is easy to dwell on the hassle created by 20 inches of heavy, wet snow being dumped on our heads in a very short period. It was back-busting just trying to keep up. Many of our friends lost electricity and therefore heat. The sounds I've been hearing on my roof do not set my mind at ease. I have to say, however, that I am glad about this white tempest in some ways. First of all, it's shockingly beautiful. More on that, and tons of photos, in the next entry. Something about these events brings people together. During this storm and the last, we have really come to know our neighbors quite well, even better than before. Last time around, no one was prepared and we were forced to rely on one another for a few shared shovels and the occasional cup of sugar. Pushing cars and shoveling out the elderly neighbors replaced my usual daily workout. This time, we were more or less prepared and dealt with the weather more appropriately but the cool thing is that we still seemed to need one another but in a softer, sweeter way. 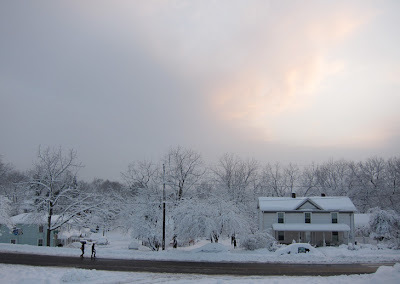 Instead of pushing their marooned Honda Civics through and over snow drifts, we joined with our neighbors in drinking wine or tea, eating yummy treats they made and watching the beautiful storm outside--and speculating about where we would seek refuge if we too lost our heat. "I think Ivanna has a wood stove. Not sure if she has dry wood. I hope we don't have to burn the furniture!" Today is bright and beautiful and the lights still turn on. The walk's all shoveled and we're looking forward to a full day of sledding with our fun neighbors. When a 50-meter trudge qualifies as an exhausting workout, it certainly is nice to such great people nearby! Note to Citymouse: Just because we love our neighbors and praise the comraderie here, it doesn't mean that it wouldn't be like that in New York. We all know that the City has a special spirit that binds people together. Who knows: we might feel even warmer and fuzzier if we were there. So don't get get all indignant about how New Yorkers all pull together in a crunch: we know that. We're just saying that we like having cool neighbors here, like the ones we had back there. It's the only way to live. I always enjoy pushing the limits of my camera phone. This one shot with at the sun, from a moving train, with the "Lola" filter from CamerBag. Many photographers use their cellphones the way they might have used a poloroid. Now they offer an aesthetic that nods very self-consciously in that direction. The scene inside the café car on the southbound Amtrak 171 Regional service from New York to Lynchburg was animated and bright. I came in to get a coke and shake the lethargy from my legs and decided to sit and look out the big windows at the enclosing winter landscape. 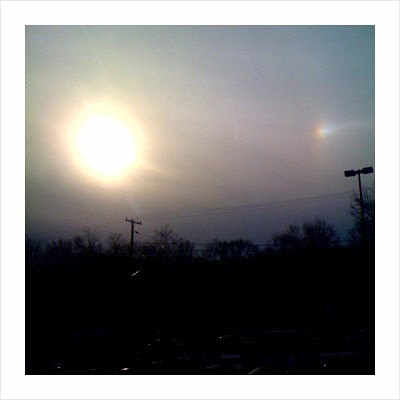 A vivid sundog told of ice crystals high in the atmosphere, vanguard to a immense winter storm. It was a good situation to push the limits of my cameraphone, as I like to do when I travel. The photographic act opened the floodgates of dialog with the fellow café car passengers. The man at the table with me turned out to be filmmaker Patrick Webb, who like me was returning home from a work stint in the City. The guy behind me with the Ricoh was Sebastijan Jemee, formerly of Charlottesville, now coming down from New York leaden with photographs of his own for a show at the Garage. He had a sidekick who I never formally met. Conversation swirled from table to table and took on the tempo of a Virginia Reel with the advent of a garrulous bank manager from Roanoke, our unofficial M.C. He introduced himself to everyone in the room with a bright smile, and though I do not remember his name, I could recite his itinerary from memory: Philly to Roanoke via Lynchburg, then back to DC then back to Lynchburg and finally home to Roanoke. A few other guys in the lounge—and they were all men this time around—nodded or injected the occasional insightful comments but largely kept their cards close to their chests. As we zigged and zagged through the Piedmont and cocktails came out, connections were made, business cards exchanged, and human experiences shared. Travel can be the act of simply getting from one place to another, a tunnel with an entrance and an exit. The train can be that way too, a bubble rocketing through a straw at a hundred miles an hour. But it is a bubble of oxygen; a social space that encourages interaction. On Amtrak there is a unity between people that is quite special and sometimes the journey can be rewarding time well spent, much more than a necessity for reaching a destination.